After work tonight, my friend Cathy and I met another friend, Renee, at Muldoon's Irish Pub in Carmel. The two of them had arranged the evening at wine and canvas, and as that it's one of my favorite things to do I was happy to tag along. 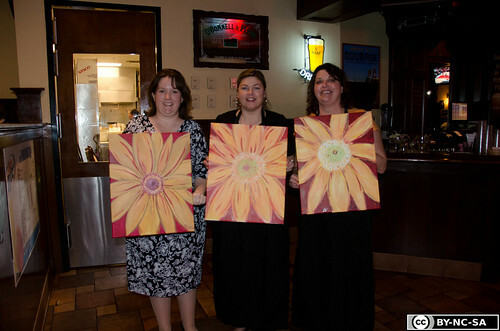 After dinner, we gathered with the other participants and painted this gorgeous sunflower canvas. We had to sit separately because of the way the room was arranged so I sat with a young woman named Karla who works for Rolls Royce. She had never been to a wine and canvas before. We had a lot of fun chatting and getting to know one another while we painted. 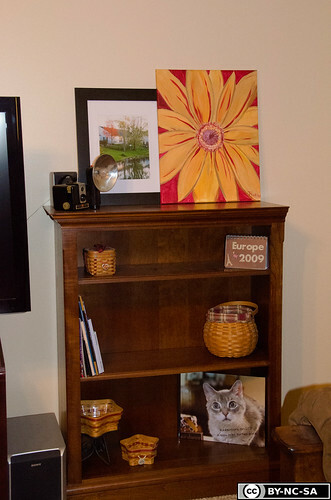 I'm going to try it in a few different locations before I make a final choice on where it will go...the bookcase is first just because it doesn't involve sticking a nail in the wall. 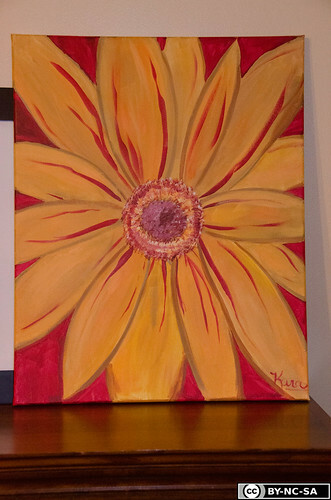 I'm thinking of making a grouping with a couple of smaller canvases with similar flowers and putting them in the master bedroom.